Birthplace : Barnesville, Ohio, U.S.
Elisha Gray (August 2, 1835 – January 21, 1901) was an American electrical engineer who co-founded the Western Electric Manufacturing Company. 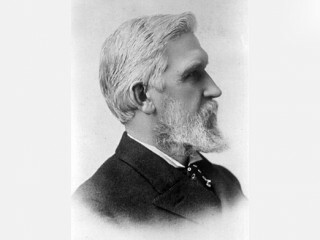 Gray is best known for his development of a telephone prototype in 1876 in Highland Park, Illinois and is considered by some writers to be the true inventor of the variable resistance telephone, despite losing out to Alexander Graham Bell for the telephone patent. Gray is also considered to be the father of the modern music synthesizer, and was awarded over 70 patents for his inventions. Elisha Gray would have been known to us as the inventor of the telephone, if Alexander Graham Bell hadn’t got to the patent office one hour before him. Instead, he goes down in history as the accidental creator of one of the first electronic musical instruments – a chance by-product of his telephone technology. Elisha Gray was born in Barnesville, Ohio in 1835. His family were Quakers. He managed to build a working model of Morse’s telegraph before he was ten, but the death of his father and his mother’s precarious health made Elisha the primary breadwinner in the family at the age of 12. He had to leave school, but later completed preparatory school and two years at Oberlin College while supporting himself as a carpenter. At college he became fascinated by electricity, particularly encouraged by his science teacher, Charles Churchill, who inspred Gray’s continued interest in electronics and telegraph. Gray often overworked to the point of illness – he managed to put himself through five years of Oberlin, but paid with five years of convalescence. He gained much of his knowledge through his hands: “While studying natural philosophy, it was my custom to make and carry with me into the class such apparatus as could be readily constructed and would serve to illustrate the lesson. My habit of actually constructing everything which I saw or read of so far as my facilities would allow, was the best possible method of fixing the principles of its operation firmly in my mind”. In 1867 Elisha Gray received his first patent for an improved telegraph relay which adapted itself to the varying insulation of the telegraph line. He was then led to devise several forms of automatic repeaters, but they are not much employed. During the rest of his life he was granted patents on about 70 other inventions. Elisha Gray, an inventor, and Enos Barton, an entrepreneur, founded Gray & Barton Company in Cleveland in 1869. To raise the money he needed for his share of the business venture, Enos Barton borrowed $400 from his widowed mother. She, in turn, raised the money by mortgaging the family home in rural Jefferson County, New York. Mrs. Barton’s act of confidence in her son proved to be one of the best investments in history. The Western Union Telegraph Company, then funded by the Vanderbilts and J.P. Morgan, bought a one-third interest in Gray & Barton in 1872. They then changed its name to the Western Electric Manufacturing Company, with Gray remaining an important person in the company. After the invention of the telephone, Western Electric became the exclusive manufacturer of telephone equipment for the Bell System. By the early 1900’s, Western had grown to be one of the largest manufacturing concerns in the world. Elisha Gray was a hard working professional inventor with some success to his credit. However, each inventor suspected the other of stealing his ideas at various points. Gray submitted a patent application for a multiple harmonic telegraph on February 23, 1875; two days later Bell submitted one for his. These closely timed submissions foreshadow the competition over the telephone, in which Gray filed a caveat on the same day Bell filed a patent. (A caveat was a document that could be filed with the patent office to signal an inventor’s intention to submit a patent at a future date, when her invention was closer to realization). So the famous controversy between Bell and Gray over the speaking telegraph, or what we now call the telephone, was really one episode in a continuing controversy over multiple telegraphy. Gray later claimed he got the first idea for using musical tones to send telegraph messages in 1867, when he was using a vibrating metal reed, or rheotome, in a circuit with an electromagnet and a telegraph key. When he closed the key, he “noticed a singing sound in the electromagnet, and by working the [telegraph] key as if transmitting a Morse message, the signals were audibly produced on the magnet by long and short sounds, representing the dots and dashes of the Morse alphabet”. Gray makes this sound like an entirely serendipitous experimental result, but by this time, he probably had heard of – and even seen demonstrated – the first telephone, constructed by Philip Reis in Germany in 1854. This device was designed to transmit musical tones. The transmitter consisted of a lever with a point, which rested on a membrane; when one sung a note, the membrane would cause the lever bounce, alternately making and breaking contact with a piece of platinum in the middle of the membrane. This intermittent, on-off current would alternately magnetize and de-magnetize a receiving electromagnet, which would reproduce whatever tone had been sung into the membrane. The Reis apparatus was widely known at the time (1880). Gray later referred to his musical telegraph devices as telephones. Unlike Bell, Gray did not document his sources; therefore, it is hard to be sure where his background knowledge came from. One story how the electric generation of sounds has been discovered deserves special attention. It was Pasteur who said that chance favors the prepared mind. In this case, a child’s game provided Gray with a mental model for a musical telegraph. In late January or early February of 1874 Gray heard the refrain of the rheotome issuing from his bathroom, where he found his young nephew ‘taking shocks’ to amuse the smaller children. With a vibrating rheotome in the circuit of a primary induction coil, the boy connected one end of the secondary coil to the zinc lining of the bathtub and held the other end in his hand. When the boy’s free hand glided along the bathtub lining, it produced a whining sound in tune with the rheotome. Gray tried the effect and found that quick, hard rubbing made the noise even louder than that of the rheotome itself. When he varied the pitch of the rheotome, the noise followed suit. Soon Elisha Gray improved his invention and replaced the bathroom with the body of a violin and a metal plate. He stated that the new “instrument” sounded in the range of the violin and the electric bathroom. In April of 1874 Gray attempted to patent a musical telegraph, which consisted of a two-tone transmitter, consisting of two single-pole electromagnets, each with a vibrating armature. Each armature made and broke contact with a platinum point which switched the current on and off to the coil. Because each electromagnet had a different electrical resistance, each electromagnet exerted a different magnetic pull on its armature and thus caused each armature to vibrate at a different frequency. Each coil and armature combination was controlled by its own telegraph key, so that each frequency could be sent separately or simultaneously. These electromagnets were connected to an induction coil which functioned like a modern transformer and stepped up the current before it was sent out onto the telegraph line. For the zinc bathtub, Gray substituted a grounded piece of galvanized tin. The patent drawing shows a man – presumably Gray himself – holding the wire from the coil in one hand and touching the tin with the other (see Figure 3 from Gray’s patent 166,096). The transmitter sent two different, audible tones which were reproduced on the tin plate receiver as the man rubbed it. The patent office initially rejected this application, on the grounds that one could not patent a circuit which included a person. So Gray converted the person into a slot into which he could substitute a variety of animal tissues, ranging from oyster shell to leather. He was eventually granted a patent in February of 1876. By then, Gray had moved on. He expanded his two-tone transmitter to a two-octave device that could send twenty-four different pitches (two octaves) over one telegraphic circuit. Each tone was generated by a single tone transmitter tuned to a different pitch. Gray often used several single tone transmitters inside more complex devices capable of sending multiple tones, such as his two octave transmitter and printing telegraph. Because he used the single tone transmitter by inserting it into slots in different inventions, it became one of Gray’s mechanical representations. Gray’s Musical Telegraph (depicted to the left) was able to play two octaves by having several single tone oscillators installed. Later models also had a simple tne wheel control. In 1874 Gray toured USA with his invention, and inspired Bell to design the Electric Harp for speech transmission over a phone line, using Gray’s instrument as blueprints. Since that time, Elisha Gray knew how to generate and transmit sounds with electricity. Thus he asked himself : “can I transmit chords, for example, many notes, or signals, on a single telegraph line…” To demonstrate his ability to transmit chords, Elisha Gray built an 8 oscillator bank that can be controlled with a piano keyboard. Rapidly, the technical demonstrations attracted people interested in music. Thus, Gray developed a two octave version of the “harmonic telegraph” and toured the entire United States. The success of sound generation and transmission changed Gray’s interests: instead of developing multiplex techniques, he became interested in sound and especially voice. In 1877 Elisha Gray organized probably the first concert of electronic music. All of Gray’s receivers embodied this principle and hence were capable of reproducing several tones simultaneously, but they employed different mechanical representations in the amplification of the vibrating core of the electromagnets. So while the Reis receiver functioned as Gray’s receiver mental model, these mechanical representations came from several other sources. For example, he used a variety of resonant cavities to amplify the sound. He got the idea of using a tin drum from a combination of the tin he used in his animal tissue patents and experiments with a violin with a metal plate on the back. His previous experience with using a bathtub as a receiver led him to substitute a wash basin. He systematically tested every type of receiver with his two-octave transmitter With these instruments Gray gave several impressive demonstrations in New York and Washington in May and June, 1874, after which he returned home to Chicago. Gray claimed that, upon returning to Chicago, he worked on the problem of creating a reliable harmonic telegraph transmitter. His two-octave transmitter could theoretically have been used for such a purpose, but Gray apparently thought it more suited to sending composite tones than isolated individual messages. His solution to the transmitter problem was to use “an ordinary electromagnet and a reed made of a piece of watch-spring, one end of which is fixed to one pole of the magnet while the other free end projects over the other pole, a short distance from it, so as to form an armature”. Each of these springs could be tuned to a particular frequency. These springs produced an excellent tone for a short time, “but the slightest change in the adjustment, even a jar of the table, causes it to break into nodes, and give a note a chord or an octave away from its fundamental”. Schemes shown here illustrate the evolution of Gray’s reed mechanical representation. In order to make his reed assemblage better able to transmit single tones, Gray made the spring into a heavier metal reed, filed the end of the reed to tune it, and added a small spring to dampen its vibrations. For a single-tone or analyzing receiver, he first tried a tuning fork attached to one pole of an electromagnet. Then he substituted a spring or lever for the fork. Next, he tried a steel ribbon clamped on both ends: “The length and size of the ribbon depend upon the note we wish to receive upon it. If it is a high note, we make it thinner and shorter; if it is a low note, we make it thicker and longer. If this ribbon is tuned to that it will give a certain note when made to vibrate mechanically, and the note which corresponds to its fundamental is then transmitted through its magnet, it will respond and vibrate in unison with its transmitted note; but if another note be sent which varies at all from its fundamental, it will not respond. If a composite tone is sent, the ribbon will respond when its own note is being sent as part of the composite tone, but as soon as its own tone is left out it will immediately stop. This I am able to select out and indicate when any note is being sent, in fact, to analyze the tones which are passing over the line”. Unlike Bell, Gray was not working to get a single preferred mechanical representation. He had specific ways of configuring his reed when it was to serve as a transmitter and as a receiver. Gray wanted to patent a variety of transmitters and receivers that could be used in combination. Gray’s cognitive style could be best described by a matrix: he developed a set of alternate mechanical representations for transmitters and receivers, and tested and patented many of the possible combinations. In Gray’s case, substitution of mechanical representations in different slots did not lead to radical changes in his overall mental model of how a multiple harmonic telegraph might work; instead, it gave him more variations to experiment with as he tried to reduce his ideas to practice. Timing is everything. Elisha Gray knew all too well just how true that old adage could be. On February 14, 1876, the day that Alexander Graham Bell filed an application for a patent for his version of the telephone, Elisha Gray applied for a caveat announcing his intention to file a claim for a patent for the same invention within three months. A caveat was a confidential, formal declaration made by an inventor stating his intention to file a patent on an idea yet to be perfected. Caveats were filed as a means of protecting an idea from being usurped by fellow inventors. On the basis of its earlier filing time – a mere few hours – and on the subtle distinctions between a caveat and an actual patent application, the U.S. Patent Office awarded Bell, not Gray, the patent for the telephone. The coincidental nature of the separate filings spurred a good amount of controversy. Indeed, in the legal proceedings that followed, the claims of Gray and Bell came into direct conflict. In each instance Bell emerged victorious. When Bell first transmitted the sound of a human voice over a wire, he used a liquid transmitter of the microphone type previously developed by Gray and unlike any described in Bell’s patent applications to that date, and an electromagnetic metal-diaphragm receiver of the kind built and publicly used by Gray several months earlier. Elisha Gray would have been known to us as the inventor of the telephone if Alexander Graham Bell hadn’t got to the patent office one hour before him. Instead, he goes down in history as the accidental creator of one of the first electronic musical instruments – a chance by-product of his telephone technology. To Gray, transmitting speech was an interesting goal but not one of a lifetime. In 1870-72, he brought out a needle annunciator for hotels, and another for elevators, which had a large sale. His ‘Private Telegraph Line Printer’ was also a success. From 1873-75 he was engaged in perfecting his “Electro-harmonic telegraph”. His speaking telegraph was likewise the outcome of these researches. Gray also built a simple loudspeaker device in later models consisting of a vibrating diaphragm in a magnetic field to make the oscillator audible. After many years of litigation, A.G.Bell was legally named the inventor of the telephone and in 1872. However, Gray was so excited by the potential of this discovery that in 1874 he resigned as superintendent of Western Electric to pursue his inventions full time. Gray’s second place showing in the race to lay claim to the invention of the telephone did not tarnish his professional reputation however. In 1880 he was named professor of dynamic electricity at Oberlin College in Ohio, where he taught with distinction. The “Telautograph,” or telegraph which writes the messages as a facsimile of the sender’s penmanship by an ingenious application of intermittent currents, is the latest of Gray’s more important works. The Gray National Telautograph Company originated in 1888 when the company bought the patent for the first Telautograph (today known as facsimile) instrument from Omnifax founding father, Professor Elisha Gray. According to the patent, the invention enabled “one to transmit his own handwriting to a distant point over a two-wire circuit”. Grays’s Telautograph was the first facsimile that wrote on stationary paper. This transmission to the Police in 1893 was the first public exhibition of the Telautograph. This “Standard” model also drew record crowds at the 1893 Chicago World’s Fair. View the full website biography of Elisha Gray.